The No. 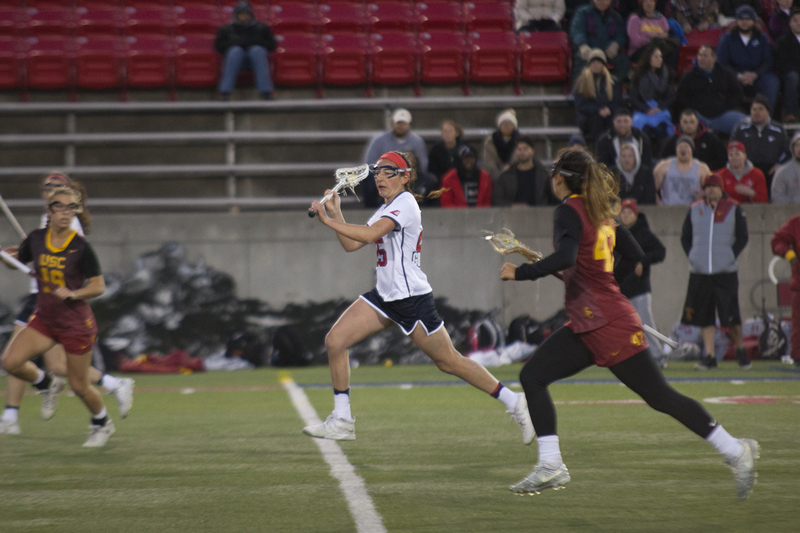 1-seeded Stony Brook women’s lacrosse team is mainly known for its offensive prowess. Senior attacker Kylie Ohlmiller and redshirt-senior attacker Courtney Murphy are both in the top 10 ranking of goals per game, and the Seawolves average the second-most goals in a game in the country, according to NCAA.com. The focus never seems to be on the team’s defense, and it should be. The Seawolves stuck to that defensive game plan and nearly shut out the Vermont Catamounts 20-2 Friday night at Kenneth P. LaValle Stadium. Vermont scored both of its goals from free-position shots, but they were unable to find the back of the net in any other capacity. Stony Brook conceded two goals in the span of four minutes, with redshirt-senior attacker Alex Bernier finding the back of the net for Vermont’s second goal of the night with 14:14 remaining in the first half. The Seawolves led 9-2 at that point of the contest and shut out the Catamounts for the remainder of the game. Spallina moved some players around early in the second half, with the team already leading 15-2 at the break. He put Gubitosi on offense and she scored the first goal of her career 10 minutes into the second half. Spallina could not have been more proud of his defender. The Seawolves put up 20 goals for the third time this season, largely due to the efforts of junior midfielder Keri McCarthy. She won 16 faceoffs, a new career-high and a program record for the junior. This was the second straight America East contest the Seawolves won by double digits, with their prior victory being a road win against UMass Lowell 20-7. Spallina was able to take out the starters early enough in the game to play freshmen and other members of the team, and he did just that Friday night. Stony Brook will be at home for its next game, facing off against No. 23 Cornell at 5 p.m. on Tuesday, April 3 at LaValle Stadium.